The Amazon Echo devices will become available in the UK (and Germany) in the coming weeks and they are pre-orderable right now. Of course this means Amazon's voice assistant, Alexa, will also roll out to become your voice activated assistant via the Amazon Echo and all-new Amazon Echo Dot hardware. In the UK Alexa gains an English accent, we don't know about the German version. Amazon Echo devices have been available for about two years in the US. The Amazon Echo will start to ship to UK customers from 28th September, and the compact Eco Dot will ship from the 20th October. Both devices can be bought in black or white finishes. Pricing is £149 for the Echo or £49.99 for the Echo Dot – however Prime members can get the more expensive Echo with £50 off. To refresh your memories, the Amazon Echo devices "are voice-controlled speakers designed entirely around your voice—they’re always ready, hands-free, and fast". Amazon goes on to explain the utility value of Alexa: "Alexa is the brain behind Echo and Echo Dot—just ask, and she’ll answer questions, play music, read the news, set timers and alarms, recite your calendar, check sports scores, control lights around your home, and much more." 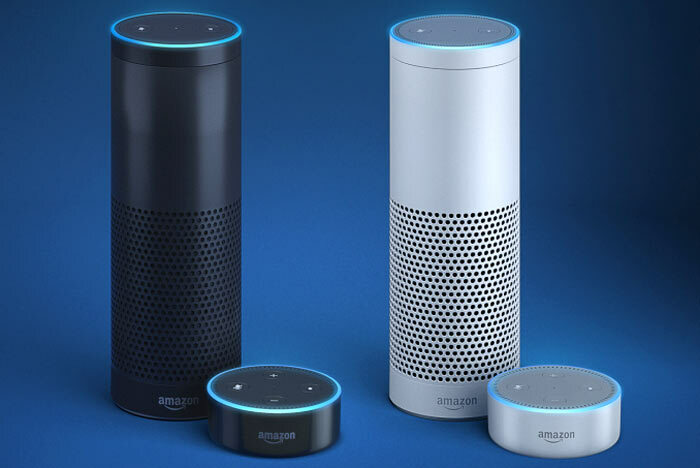 These devices work from across the room and as Alexa is cloud connected 'she' can learn and gain further 'skills'. The new Echo Dot uses the same high-quality array of seven microphones found in Echo but is much smaller and cheaper. To cut the size and price Amazon has reduced the room-filling on-board sound system down to a small single speaker – but it offers a 3.5mm audio out to connect to any system you already have. Amazon is encouraging multi-buys of its Echo Dot devices, so you can keep one in each room where you would like them. For example if you buy 5 dots you can get one free. Seems like a nice idea for those with connected homes but seeing as though I don't have a single smart appliance (not even a TV) due to a limited budget and a two year old who'll break them its not something I'd invest in despite having prime. Quick question to hexusites with bigger budgets - Is home automation worth bothering with or are automated lights/thermostats etc just a gimick? I've had the budget for Smart appliances, but still didn't think they were particularly good value. I liked the look of the Nest, but I can't imagine using the extra features after the novelty period has worn off. My thermostat works fine, I can set it on a timer and adjust temperatures and the turn of a dial. It's getting on for 10 years old but it's still wireless and works fine. The IoT lights seem nice, but I've got 30 years under my belt of just using light bulbs, and they still work fine. I can get a nice crate of beer for the price of a single bulb that will most likely be set to “standard” white and turned on at the wall anyway. And you can't just get one, and once you get past a couple of units you start looking like an amateur mobile disco outfit from the examples I've seen. I do have a smart TV, I find the “Smart” bits to be stupid (I refuse to use them) and just have a FireTV with Kodi plugged in to it instead. I don't feel like I'll ever be convinced by the “Smart home” concept. A lot of smart home stuff is too orientated around San Francisco/Silicon Valley mindset and the people who live there. It doesn't translate well outside of those areas. Now the Amazon Echo is useful but again depends on your usage patterns and how deep into the digital economy you are. Also interesting after all the hysteria around xbox one kinect a few years back people are buying devices that listen for your every word, MS was ahead of the curve just didn't know how to sell it. I currently have a number of smart home gadgets - thermostat, kettle, lights, and power sockets, and i'll be using it for voice control of all of these by the end of the year. Unfortunately none of my gadgets are supported out of the box yet (since half of them i've cobbled together myself with z-wave components) but the beauty of Echo over similar systems (Siri/GoogleHome for example) is that there is a nice open API available, and even without that there is IFTTT support which will let me do everything i need anyway, without writing a single line of code. The IFTTT support is probably the biggest boon really as that enables a huge amount of integration into digital life, outside of just home automation. I am also a prime subscriber so make extensive use of prime music, and it's a big selling point to be able to use that truly hands free without having to pair my phone to my speakers each time I want to use it. It's not for everyone, but as a geek who loves gadgets and is a big fan of the “Smart Home” concept, it's a brilliant device. We also know that there are more and more features coming to the UK version of echo (The US has over 1000 already) - so the possibilities are great. Can't wait - most exciting gadget of the year for me imo.